Weeds are quite possibly the most annoying thing in your yard, especially in the warmer months. They make their way through cracks in the driveway, find their way into flower beds, grow proudly pop up in the garden and sprout just about everywhere imaginable. If you have kids or pets around, you probably don’t want to spray your yard with harmful chemicals. Skip the Roundup and consider using a more natural weed control. Make the best natural weed killer using these organic weed control recipes to keep those pesky weeds gone for good. Listed below are some items you may need to mix up the best organic weed killer. Hopefully you already have these things around the house, but if not we’ve linked to where you can order them online. Now that you have the supplies ready you’ll need to mix up a batch. Spray weeds with this vinegar weed killer during the sunniest time of day for optimum results. If you want to buy a ready made solution, check out our review of the Avenger Organic Weed Killer. If dandelions are covering your lawn, this is a good one to use. Pour some of the mixture into a spray bottle that has a “stream” setting that will give you a direct shot (not mist). Spray the mixture onto the dandelion heads. The spray will kill the dandelions without killing the grass, as long as you don’t get the mixture onto the lawn. On that note, like other toxic weed killers this recipe will not only destroy your weeds, the acetic acid in the vinegar might also harm other plants and grass that come into contact with the spray. So no matter the type of weed, use with caution and squirt directly to the weed itself versus applying to the area around it more liberally. Another similar recipe uses apple cider instead of white vinegar and no dish soap. Fill a spray bottle with the apple cider vinegar. Place a funnel into the mouth of the bottle and add salt. Shake the bottle well to mix the ingredients. Then, spray the weed and they should crumble away within a day. Check out the video below to see how easy it is (and before and after). Does vinegar and Epsom salt weed killer work? As you can see in the video above, yes it does. But like the spray above, the vinegar is highly effective so don’t overdo it. Try this concoction if you have larger surface areas like a patio or mulch bed instead of concentrated spots in your yard. It’s less harsh than the recipes that include vinegar so works well for new growth weeds that are easier to kill. Boil a pot of water and add one tablespoon of salt. Pour over the weeds immediately while the water is still hot. You should see results almost instantly. The recipes above work well but can hurt your grass. So if you’re looking for some safer ways to kill weeds without ruining your yard, here are three homemade weed killers we suggest for lawns. Be sure to read each carefully, so you get the results you’re looking for. To prevent weed growth in your lawn, remove all existing weeds first. Sprinkle corn gluten meal on your lawn. It suppresses the development of small feeder roots and is effective at preventing crabgrass, dandelions, curly dock, knotweed, lamb’s quarters, pigweed and plantain. It will not hurt the grass in your yard or any other plants. Combine ten parts water and one part liquid dish detergent in a spray bottle. 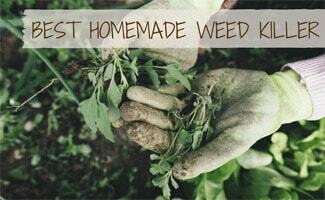 Spray the weeds in the mixture until soaked during the hottest part of the day. The water will evaporate due to the heat and the soap in the mixture will get sticky on the weeds drying them out. Weeds can be a pain in the grass but they are inevitable without a watchful eye and active yard maintenance plan. We hope some of these recommendations can help you get your weed situation under control. Once you do, you may want to consider addressing some of the other chemicals you are exposed to in every day life. We’ve got natural solutions for shampoo, mosquito repellent, baby food, helping you get to sleep, and depression and anxiety, just to name a few. Thanks and here’s to your health and happiness! What difficulties are you experiencing getting rid of a particular weed? how does this work on very prolific poison ivy? We haven’t tried it on poison ivy. “Does vinegar and Epsom salt weed killer work? You bet it does!” Um, no, not it does not. Salting your ground over and over again will lead to dead soil. And vinegar – especially the kitchen kind – may kill some plant leaves, but not the roots. Stop poisoning your soil (salt NEVER goes away; maybe with enough rain it will someday wash away. This is why invading army’s would salt enemy fields – it virtually permanently ruined them). Because – science! I have been fighting Bind Weed for years and it never gives up. I have it in my landscaped areas which are very large. This year it is coming up everywhere again. I have spent countless hours digging it up, pulled it out, put down weed fabric, sprayed with Poison Ivy vine killer by ortho and still its back. Without nuking the whole yards what can I do? Will this mixture kill “puncture vine” (aka goats head) weeds? We haven’t tried it on puncture vine, but that’s not to say it wouldn’t work. Our weeds are out of control! I’ve tried everything and they still keep popping up – mostly in the mulch beds. We have a tree that sheds like crazy so I think that’s part of the problem. Will try these and hopefully it helps!